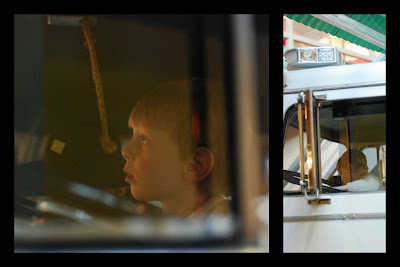 There is a real firetruck to drive. We went ahead and purchased a year membership to the museum and hope to use it a lot (Brian and Colin are having a special daddy/Colin time there right now since Jane was napping and I'm doing laundry.) I took the kids the other day and we even saw a coyote on the way home. Not too sure I like seeing coyotes where I am walking with my kids. Looks like fun. Often those passes will also work at zoos, parks and museums in other cities too. Laura and Tom used their Thanksgiving Point pass at the San Diego Wild Animal Park.